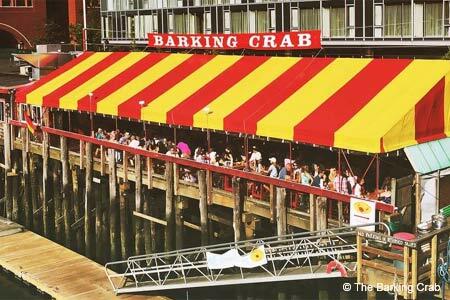 You can’t beat the skyscraper-lined harbor view and fresh seafood at this touristy spot. : Once a summer-only restaurant, this popular waterfront venue has evolved into a year-round favorite. In the summer months, request a seat on the back deck and sit at a communal picnic table while enjoying the view. Get down and dirty and rip apart a lobster (with a requisite bib around your neck, of course) or nosh on fried scallops from a cardboard box. There's a full menu of fried, seared and grilled items from the sea as well as clambakes for one to four diners, a raw bar, lobster rolls, scampis, and even a 12-ounce fire-grilled rib-eye. Heartier appetites can consider the hot crab dip, filling crab cakes and spicy Rhode Island-style calamari. Feeling up to a challenge? Order the Neptune platter, which comes with a two-pound lobster and a mixed-crab bowl. End the visit right with “crabby” cannolis stuffed with creamy ricotta. There’s a second location in Newport in the Brick Market Place.